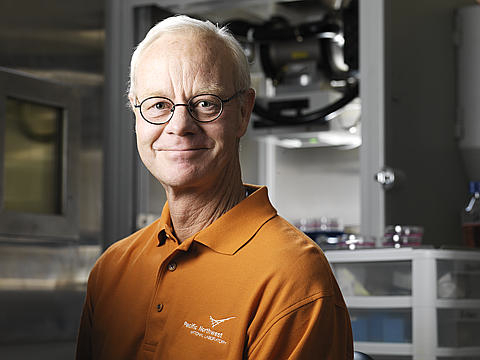 Radiation biologist Dr. Bill Morgan, Pacific Northwest National Laboratory, was interviewed by Nature magazine for an article on a recent international study on the risks of low dose radiation exposure. Morgan, an international expert on radiation effects, discussed the difficulty of communicating even miniscule health risks from low dose radiation exposure, such as that received from medical scans. Morgan is a Laboratory Fellow at PNNL and director of radiation biology in the Biological Sciences Division. He is a scientific representative for regulatory agencies such as the United Nations Scientific Committee on the Effects of Atomic Radiation, the International Commission on Radiological Protection, and the National Council for Radiation Protection. Reference: Abbott A, "Researchers pin down risks of low-dose radiation," Nature 523, 17-18 (02 July 2015) DOI: 10.1038/523017a.